Hi all! I have been absent over the past week, winding down from NY and heading to Disney World a few days later. 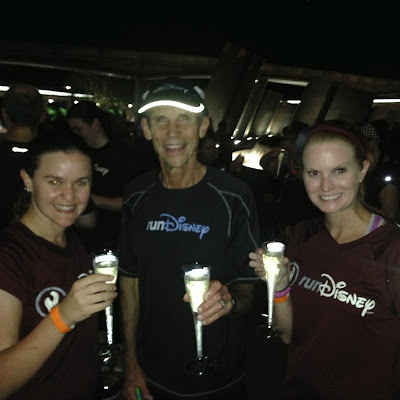 I was honored to be part of the runDisney Wine and Dine Meetup on Thursday night! This was the first time there has been a runDisney meetup under the nighttime stars. When I arrived on Property, I instantly ran into Meghann of Meals and Miles. We made a quick plan to head over to the Meetup together. Meghann just completed her first full Iron Man and I was so excited to hear her adventure in person. She is so inspiring! This was my second time attending a runDisney meetup (first was during 2013 Marathon weekend) and this meetup was HUGE! 125 runDisney fans in attendance, along with a team from New Balance. Upon receiving our adorable maroon (or wine) colored runDisney shirts, Meghann and I headed straight to ride Test Track. We received an anytime Fast Pass in our Meetup packet. 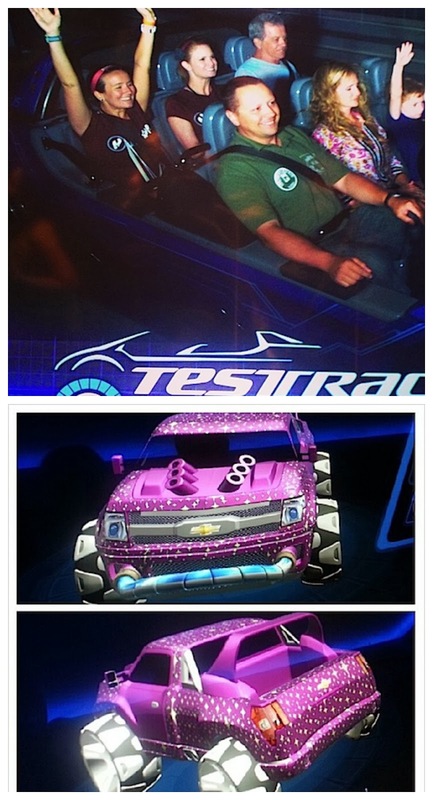 This was my first time riding Test Track in a car I helped designed - every other time, we join another family in the single rider line. We made the most obnoxious pink truck with every single accessory possible. Shockingly enough, our truck did very well on the track. After racing in our pink truck, we found Rachel from Runners Tales and headed over to the meetup locations. The first portion of the meetup was a private viewing area for Epcots nightly firework and light show - IllumiNations. Once there, it seemed that everywhere I turned and looked, I was face to face with bloggers who have inspired me over the past two years. Kristen of Stuft Mama, Julie of PB Fingers, Tina of Carrots n Cake, Sarah of Skinny Runner, Monica of Run Eat Repeat - even FitFluential CEO Kelly Olexa! It was truly incredible to be surrounded around all these amazing women at a runDisney event. After the IllumiNations show, we ventured over to the American Adventure Stage. We sampled food and wine from the Epcot Food and Wine Festival (Trickin Chicken and Vegan Chardonnay from Terra - the Vegan stand). runDisney Social Media director, Darrell Fry got on the stage and was joined by Faron Kelly, Director, Marketing & Communications, Disney Sports. 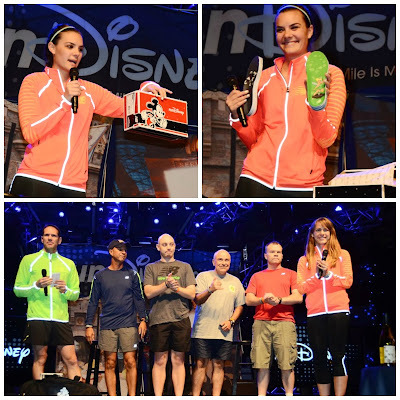 The always funny duo were quick to give some prizes away, including 3 free entries to any runDisney race! Next up was Jeff Galloway, runDisney's official trainer and founder of the Galloway Method, joined by Tara Gidus, runDisney's official dietitian. Jeff gave his advice on training for a night race while Tara told us how to eat properly through the day for a night race (multiple small meals vs. one large meal). I got to meet Chef Mickey which was awesome. I have not met Chef Mickey prior to this visit. 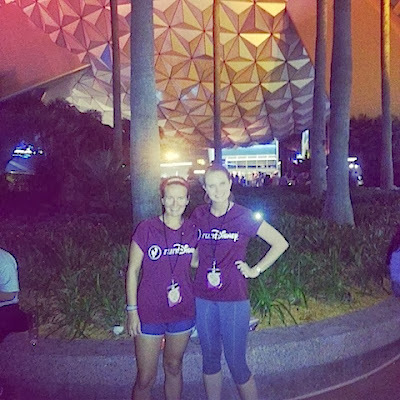 Nearing 11:30pm, we were ready for a night time run around Epcot. Like the past runDisney meetups, we were split into two groups - run walk and run. The run walkers get to run the Galloway method with Jeff Galloway. I opted for that group for multiple reasons (first run since NY Marathon, time of night, etc). We did a 20/20 split (20 seconds running, 20 seconds walking). Our pace was 11:10. Rachel and I were even spotted by a photographer. After finishing up our run, we had a champagne toast. This made me a very happy girl! Faron gave a great runners Irish cheer, which had everyone cracking up. Rachel and I found Jeff Galloway and thought it would be a perfect moment to get a photo with him. Not many people can say they ran the Galloway method, finishing with a glass of Champagne with Galloway. Thank you again runDisney for an amazing night. I am so excited to run my first ever Wine Dine Half Marathon in a few hours! If you are interested in attending a runDisney meetup, make sure you follow the Disney Parks blog and runDisney's twitter account. runDisney gives hints as to when the registration for meetups go live and formally announce it on the blog with instructions on how to enter for a chance to attend. I've been following you on Facebook too. I had some friends run the half too. I love Disney and Disney races.....they are just so expensive!!!!!! I need a race sponsor!!! !